Figure 1. Gray leaf spot has increased quickly in some areas of Nebraska and is threatening yield. Gray leaf spot (Figure 1) has increased at alarming rates in some areas of the state. Disease severity has increased so that it's now covering more leaf area with lesions and developing on leaves higher on the plant. This and other diseases will increase as long as weather conditions are favorable, especially in susceptible hybrids. Reviewing the hybrid disease ratings provided by seed companies, as well as other higher risk growing conditions such as continuous corn and minimum tillage, can help indicate which hybrids may develop severe disease and need treatment. Distribution of southern rust continues to expand in Nebraska and has been confirmed as far west as Dawson County, with unconfirmed reports elsewhere, including further west. As samples are received and confirmed with the disease, the southern rust distribution map is updated. The disease has been confirmed in Iowa and South Dakota and is likely distributed further across Nebraska and the U.S. than is indicated on the map. At this time, southern rust incidence and severity in most locations has reportedly been low. Severity may be limited by recent cool night temperatures. The confirmed distribution of southern rust can be observed on the IPM PiPE website . The most reliable method for identifying corn rust diseases is based on examination of microscopic spore characteristics, which can be done quickly for samples submitted to the UNL Plant and Pest Diagnostic Clinic. Southern rust spores are usually orange/tan, produced mostly on top side of the leaf, and easily wiped off. They can easily be mistaken for other diseases. 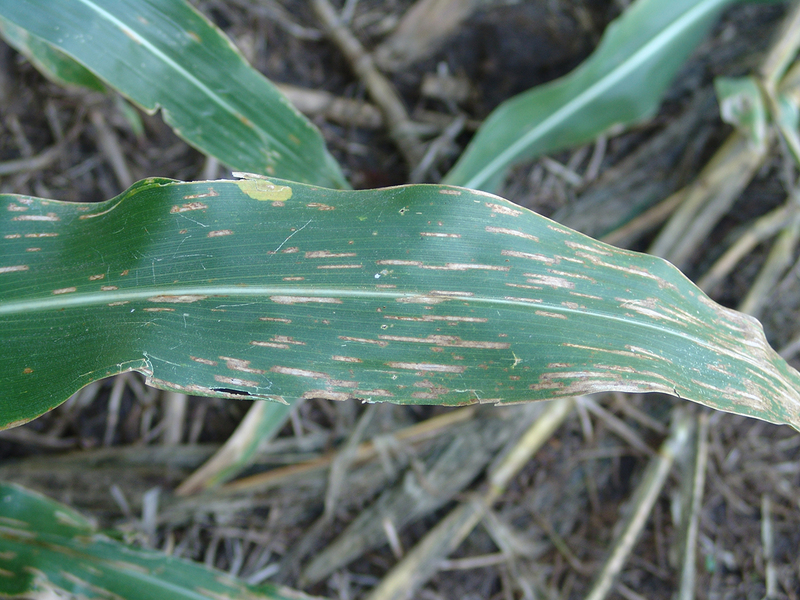 The increase in gray leaf spot and the presence of southern rust has led to increasing questions about late applications of fungicides on corn and their potential for protecting leaf area and conserving yield potential during these final weeks of grain fill. Late season fungicide applications have been the focus of studies conducted by UNL researchers at the UNL South Central Agricultural Laboratory (SCAL) near Clay Center. Figures 2 and 3. Fungicide applications with one of two products were made to two hybrids at various late season timings between tasseling (VT) and full dent in corn planted May 14. Yields were usually higher when compared to the nontreated control, but not always consistently across the six replications to be statistically significant. 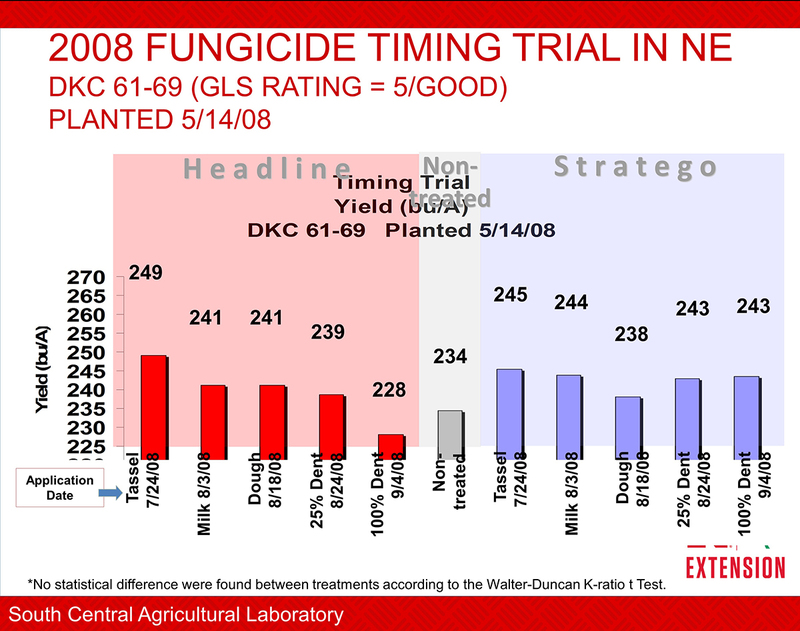 There was increased interest in late fungicide applications after the 2006 southern rust epidemic and gray leaf spot was a greater concern annually. 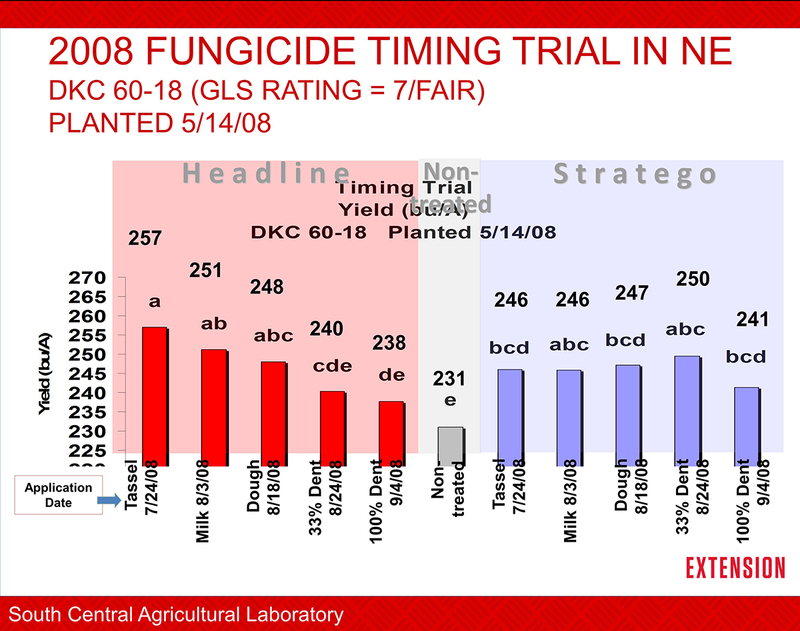 Figures 2 and 3 show yield results from a 2008 trial conducted at SCAL. The conditions of this trial more closely replicate those this year than more recent research, with regard to increased gray leaf spot pressure and low levels of southern rust, although the fungicide products and hybrids tested are dated. In addition, the two corn hybrids in this trial were later planted (May 14) and may better represent later planting dates of some of the 2015 corn. Treatments of one of the two fungicides were made at the full tassel (VT) through full dent stage. In general, most treatments increased yield compared to the nontreated control, although not all of them were consistent enough in the six replications to be statistically different. The yield response to treatments was more consistent in the hybrid that was more sensitive to gray leaf spot and had more leaf area affected (data not shown). Bear in mind that these results only reflect a single year and location. Results could differ if repeated under different testing conditions. Treatments made during the dent (R5) substages are much less likely to provide a yield response than those made earlier. Although, overall yield, especially test weight, could be affected by disease during the dent stage, when as much as 55% of dry matter is left to accumulate in kernels (Abendroth et al., 2011). These and other research results will be shared at the South Central Agricultural Laboratory's Field Day next Wednesday, August 19. Registration for the Field Day starts at 8:30 a.m. and tours run until 4 p.m. Lunch and refreshments are included. CEU credits will be available. There is no cost for the field day, but RSVPs are requested to 402-762-3644 or jrees2@unl.edu. More information can be found at the UNL SCAL website or in a segment on this week's Market Journal. Other resources are linked below that are available to help identify diseases and track the Nebraska counties where southern rust has been confirmed. Fields should continue to be monitored for disease development so that treatment decisions can be made in a timely manner for better disease management, if needed.